In one for the anoraks, no one won the opening Formula 3 race at Norisring this weekend, following the disqualification of original winner Daniel Juncadella. Carlin’s Will Buller, who finished 2nd on the road, kept his 2nd position; however the record book will show a blank space next to the “winning driver” slot. Juncadella was running 2nd behind Mücke Motorsport’s Pascal Wehrlein on lap 39, when he missed his braking point into the sharp turn one, slipping into the side of the innocent Wehrlein – Juncadella continued, while Wehrlein dropped to 7th spot. Wehrlein may well have fallen further had it not been for an immediate call for the safety car. With only two minutes remaining in the event, the race director brought out the red flag, ending the race. Juncadella jumped into the lead from the start; however the Spaniard began suffering problems as the race aged, due to heavy wear suffered by the right rear tyres of his his Mercedes-powered machine. Wehrlein stayed glued to Juncadella throughout, eventually taking the lead on lap 34. The later accident was not the only collision Juncadella was involved in – on the same lap as his collision with Wehrlein, the Prema man was also clashed with teammate and title challenger Raffaele Marciello. As the Italian began to draft around the outside of his teammate on the approach to the final corner, the pair glanced wheels, spinning Marciello into the unforgiving wall, breaking his front wing. Juncadella again continued; however the wounded Marciello made only as far as the turn 2 / 3 chicane, before sliding into the wall at the exit. Regardless of Juncadella’s penalty, it proved a disappointing ending for Marciello. The Italian had started on pole, only to drop to 5th after a poor getaway. Moves on Bernstorff (lap 11) and Buller (lap 19) made that 3rd, before he latched on to the leading duo. With both Wehrlein and Marciello removed from the action, Juncadella temporarily inherited the win when the red flag was introduced at the end of lap 42, but was excluded ninety minutes later. All the action action ahead promoted Buller (who enjoyed a relatively quiet race) to 2nd – a position he maintained despite Juncadella’s exclusion, while Emil Bernstorff took a hard-earned first podium of the season in 3rd. Pietro Fantin’s finished 4th – the Brazilian being the first of the British F3 runners. The Carlin man spent the running challenging Bernstorff, but struggled to find the Englishman’s breaking point. Fortec’s Felix Serralles took 5th overall ahead Mücke Motorsport pair Felix Rosenqvist (6th) and the hobbling Wehrlein. Harry Tincknell took an encouraging 8th for Carlin. The Englishman beat Sven Muller and Tom Blomqvist after several laps trapped behind the sluggish Sandro Zeller. Geoff Uhrhane and Nick McBride drove solid races to 12th and 13th, although the latter was lucky to come away unscathed following a mid-race bump with Philip Ellis. For his troubles, Ellis retired although that had more to do with hitting the turn three wall earlier in the lap. Jack Harvey took a lucky 14th in a race that included a collision, a drive through penalty and a damaged front wing. It fell apart for Harvey on the opening tour, when the Lincolnshire man climbed the turn one kerb, collecting teammate Jazeman Jaafar in the process. Damaged, Harvey pushed Jaafar into the first lap pack, forcing Alex Lynn (Fortec) and Lucas Wolf (URD) wide and into a crash of their own. Lynn pitted for a new front wing; however Wolf’s Dallara was beyond repair. The opening lap also saw Carlos Sainz Jr hit the wall at exit of turn three, ending his race there and then. All these incidents brought out a four-lap long safety car period, as debris and broken machines littered the bumpy streets. Prema Powerteam’s American pilot Michael Lewis also found himself in a spot of bother at turn one. Two laps after the restart, Lewis slid into the side of Derani in turn one, causing both to drop out with damage. 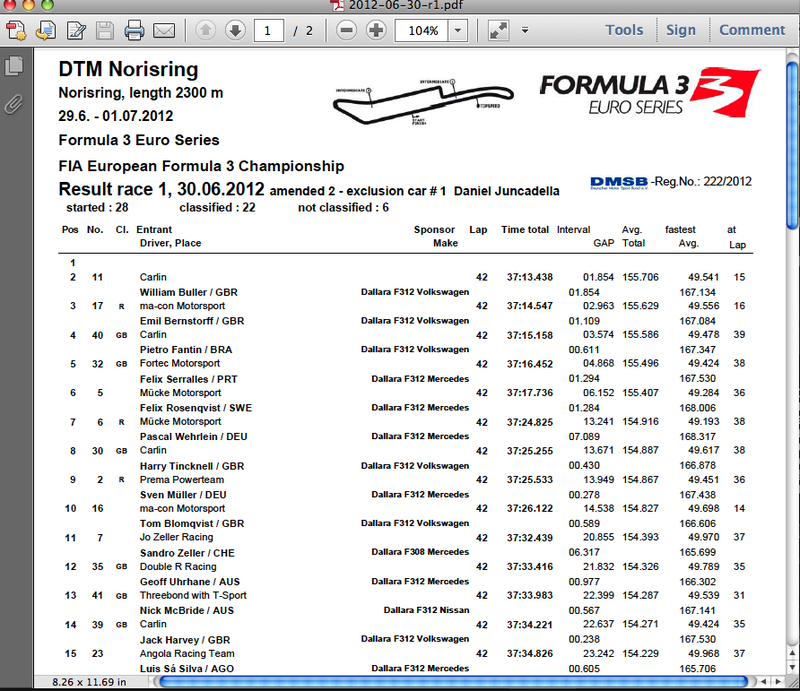 The clash pushed Hannes van Asseldonk (Fortec) and Muller wide, with the latter losing time and positions. Van Asseldonk lost his front wing in his attempt to escape the crash.